Conduct a brainstorming session about smoking. Have the students make a chart of what they know, what they want to know, and what they have learned. Ask students what they know about smoking. Do they know that it is harmful? Do they know why it is harmful? Have they heard of nicotine? Have they heard of the concept of addiction? Write down their responses on a sheet of newsprint. You will refer to it after students complete the experiment. To introduce the experiment, show the first segment of the DVD. Then discuss the experiment with the class. By the end of the discussion, students should understand that they will be doing an experiment to test the effect that tobacco has on a cup of water. After observing that the water turns yellow, students will have a better understanding of what effect tar and nicotine have on the body. The lungs, for example, become blackened from excessive smoking. Hand out the instruction sheet and go over the procedure with the class. Tell students that they will be working in groups to perform the experiment. Each group will begin with three cups of water. Students should put a cigarette in one cup, a leaf in the second cup, and nothing in the third. The cups should be labeled "Cigarette," "Leaf," and "Water." Explain to the students that the third cup is a control, a standard against which to judge the other two cups. Help students understand that a control is an integral part of a scientific experiment because it provides a baseline against which to compare results. Have students go to their groups. Give each student a log sheet. Before setting up the experiment, ask the groups to develop a hypothesis about what is going to happen to the cups of water. Have each student record his or her group’s hypothesis on the log sheet. Changes in odor over time. Which cup changed the most? Which cup changed the least? Why? Now that you’ve seen what the cigarette did to the water, what effect do you think it might have on your body? You may have to guide students a bit on this question. Explain to them that what happens to a cup of water and what may happen in our bodies is quite different. After students have completed the experiment and filled out their log sheets, have them work in their groups to develop conclusions. Ask them what this experiment made them think about cigarette smoking. Have each group present its findings and conclusions to the class by creating posters or writing a report. As a class, write a summary describing the results of the experiment. To reinforce their ideas, show the final segment of the DVD. CONGRATULATIONS! YOUR STUDENTS HAVE JUST COMPLETED MISSION 5 OF BRAIN POWER! 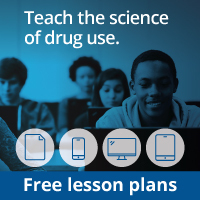 Take out the list of ideas about tobacco and nicotine that students developed before they did the experiment. Ask if their ideas have changed. If so, how? Then ask if they have additional ideas about tobacco that they would like to add to the list. Show the students a poster or an overlay of the neurotransmission model from module 3. Ask the students if they remember what neurotransmitters do. Discuss the role neurotransmitters play in receiving and processing messages sent throughout the body. Bring out the poster showing the effect of nicotine on neurotransmission (PDF, 47KB). Ask students what they think it means if nicotine takes the place of a neurotransmitter. Explain that when nicotine takes over the functions of a neurotransmitter, it is the beginning of addiction. Tell students that nicotine affects the body in another way. It makes people feel as though they need nicotine to feel good. This is another important fact about addiction, and it helps explain why being addicted to nicotine means that it is very difficult to stop smoking. In addition, because the body has become used to nicotine, it has a physical reaction when nicotine is taken away. These reactions include restlessness, hunger, depression, and headaches. Point out that the best way to avoid addiction to nicotine is to never start smoking in the first place.